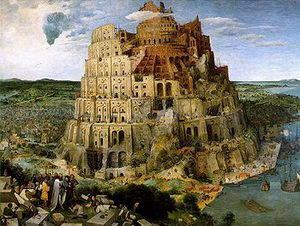 So the beginning of Nimrod's plan had its origin at Babel which was later known as Babylon. This city of Babylon with a tower “whose top may reach unto heaven” was built by Nimrod (Genesis 10:8-10; 11:4). They called the tower “Babel, the gate to heaven,” but God called it “Babel, confusion,” and there God confused the language of the people which forced them to scatter. These people wanted one government to rule the world and one religion to sway the hearts of man. This was Satan's attempt to defy God and His authority, but God came down and stopped this rebellion in defiance of His command for mankind to replenish the earth (Genesis 9:1) by confusing their language. So they stopped building and were scattered to different parts of the world (Genesis 11:8-9). Nimrod had a plan to strengthen his evil religious system and so he married his own mother Semiramis. She was the first deified queen of Babylon and Nimrod was the first deified king. Nimrod's and Semiramis' followers plunged so deeply into the occult that they even sacrificed babies to Satan in their worship of him. This became a common practice until Shem who was one of Noah's three sons and the great uncle of Nimrod, in his anger and wrath killed Nimrod and cut him up into small pieces as an example to others to not commit such abominable sins. Because of Nimrod's death, his followers and Semiramis were afraid to continue in their worship of Satan for fear that what happened to Nimrod would also happen to them, so a mystery religion developed at Babel where Satan could be worshipped in secret. The same thing is happening in these last days. Satan is using mysteries and deceptions to deceive people into thinking that they are worshipping the true God when they are actually worshipping Satan. This counterfeit religion ceased for a short time but Semiramis had a brilliant idea of how she could successfully revive her and Nimrod's pagan religion with a new form. It was not long after the death of her husband that Semiramis became pregnant. She claimed that when Nimrod died he went up to the sun, and so the sun then became a symbol of Nimrod. She told the people that a ray of the sun had come to her and impregnated her with a child and that it was actually Nimrod coming back in a reincarnation of the sun god. The child was called Tammuz and these three were worshipped as the personification of the sun god, and this is where we find the first three came into existence. But this mystery religion was nothing more than Satan worship. Semiramis and her priests of Satan were deep into the occult and were masters of lies and deception. Everywhere there were statues or idols of this mother/child cult. Semiramis was soon hailed as “The Queen of Heaven” (Ashtarte). Her symbol became the moon and her husband Nimrod, was called Baal the sun god and hence his symbol became the sun. So we find that the trinity has its origins all the way back in Babylon. If God had not interfered and confused the languages then we would have had no hope of any truth that we have today. We also find that this worship of three was carried to all the different cultures that we have today but they took on different names since God had confused the languages as we find in Genesis 11. So in Egypt, their trinity became Osiris, Horus and Isis (top left). In Greece it was Zeus, Apollo and Athena (top right). And in India there was Brahma, Vishnu and Shiva (bottom left). Notice also the yellow halo around their heads which represents the sun god. The system of Rome adopted the same symbol where you see saints with a halo around their head. Most tend to think that this means they are holy but it actually represents the sun god. And speaking of Rome, they had Jupiter, Mars and Venus (bottom right). These few are by no means a comprehensive list but in all the many cultures and pagan systems of worship, we find the ultimate worship of their gods always ends up in three. The common denominator is that they all started at the very same place. But now that they had different languages, they all had different names. As far back into the ancient world as we can go, we find that all known cultures had a three in one triune god. There is a lot more that could be covered on this topic but what we have is adequate for this study. The parts that have not been examined can be briefly covered by the following summary of the heathen trinity. There are always three beings in this triune god. One is the father, one is the mother and one is the son. The son is also the husband of the mother. The son is the father incarnate. All three have been deified as gods. Often these three are said to be one god. That is, one in three forms, or three in one. The father is often not mentioned and instead the mother and son are worshipped by themselves. At times the heathen trinity is seen as one god playing three roles, and is pictured with three heads. At other times this one god is seen with three faces on one head. In several branches of heathenism, the third person of this trinity is regarded as evil and a destroyer. In this last version, the 1st person is the creator, the 2nd person is the maintainer, and the 3rd person is the destroyer. None of these heathen concepts should ever be found in Christianity! 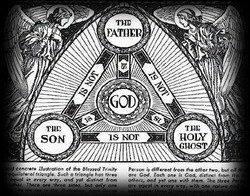 Remember that the trinity doctrine, and why it is called as such, is as follows. The Father is God, Jesus is God, the Holy Spirit is God, and yet there are not three gods but one God, and that's the trinity! In other words, 1+1+1=One! This of course makes no sense at all and is not found in the Bible, so where did it really come from? The very first three-in-one trinity was the worship of the three stages of the sun! (1. New born at dawn. (2. Mature and full grown at 12 noon. (3. Old and dying at the end of the day. (Jordan Maxwell. BBC of America Quoted in Exposure Vol. 5, No. 6 1999). All three of course were one divinity being the sun. And so the main medium through which Satan was worshipped in Babylon was the sun. They noticed that the sun had three distinct stages and this fitted well with their belief as they were already worshipping three. Thus the sun was worshiped as three gods. The rising and new born sun as it came to life, the mature and full grown sun at noon, and the dying sun as it set at the end of the day. 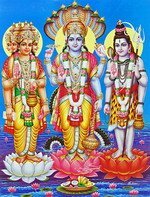 Yet while they worshipped the sun as three gods, they were not three gods but one god! So the rising sun was god, the midday sun was god, the setting sun was god, and yet there were not three gods but one god! In other words, 1+1+1=One! So here is the true absolute origin of the trinity doctrine. And this became incorporated into this mystery religion and the worship of Satan. And all of this started in Babylon. So as each group travelled it took with them the same concept except they now had different names. 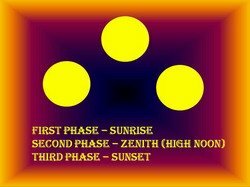 The pagans also believed that the three phases of the sun were the three manifestations of the supreme deity as evident in the Egyptian sun gods. See image left. This became known as the three in one god. In order to be able to represent their sun god properly, they combined all three stages of the sun into one, and the result of that would be a picture of what they really believed. When you put all three parts together, you have one and this symbol became a symbol of the sun god, and the being behind that worship was Satan. They found this symbolism very effective and used this to disguise their true religion. These three interlocking circles formed an equilateral triangle which is a triangle with three equal sides. With an equilateral triangle all sides are equal and must add up to 180 degrees. Each side was representing a phase of the sun with each angle of the triangle being 60 degrees. It does not take a genius to see that the next step, 60 + 60 + 60 represented 666. See image right. This is derived from their system of worship of 36 supreme gods, which included the sun god as number one which they believed to be the father of all the other gods (Nimrod), and the moon was the mother god (Semiramis) as number two. The other gods numbered 3 to 36 were considered the children of the sun god, and included the various stars and constellations that these gods were associated with. These numbers from 1 to 36 total 666, which they also assigned to the sun god since it was the father of all their gods. The calculation is simply this: 1 + 2 + 3 + 4 + 5 + 6 + 7 + 8 + 9 + 10 + 11 + 12 + 13 + 14 + 15 + 16 + 17 + 18 + 19 + 20 + 21 + 22 + 23 + 24 + 25 + 26 + 27 + 28 + 29 + 30 + 31 + 32 + 33 + 34 + 35 + 36 = 666. Note the Babylonian solar seal amulet with the numbers 1 to 36 and the number 666 underneath these numbers that represented the sun. The numbers are so arranged that each row and column as well as the two diagonals add up to 111. They feared their gods and believed these amulets had more power to protect them from their god's striking them down with this number arrangement. These solar seals are almost impossible to find today and most are in private collections where Satan wants them. This true origin of the number 666 is known by very few and once again how Satan wants it as it reveals too much truth on what this number is all about and who God now assigns this number. See 666 number of the beast for detailed information. So the pagans used these symbols and numbers to hide the worship they were giving to Satan, and sun worship or Satan worship became the religion of 666. And of course in the Bible we are told this is the number of the beast and it is the number of a man. “Here is wisdom. Let him that has understanding count the number of the beast: for it is the number of a man; and his number is Six hundred threescore and six.” Revelation 13:18. And of course the beast (Papal Rome) that has this number is also called Babylon in Revelation and here is one reason why. This number has been found on many archaeological digs in Babylon such as the solar seal shown above. This system of Satan worship was a mystery religion and explains the meaning of the word mystery in Revelation 17:5 “And upon her forehead was a name written, MYSTERY, BABYLON THE GREAT, THE MOTHER OF HARLOTS AND ABOMINATIONS OF THE EARTH.” See who is mystery Babylon the great. The image to the right is called the Shield of the Trinity. The precise origin of this type of diagram is unknown, but it is said that it was influenced by 12th century experiments in symbolizing the trinity in abstract visual form. This is the God that is worshipped in the Roman Catholic system. They are worshipping a God that is three in one and one in three. And we know this concept does not originate from God's Word but goes all the way back to Babylon. 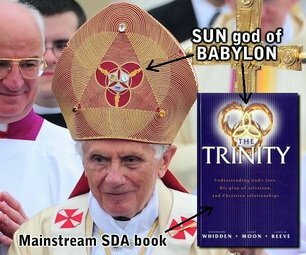 Despite the origin of the Shield of the trinity being unknown, you will notice all the similarities to the symbolism from Babylon and so the absolute origin no doubt came from a much earlier time. Notice that we still have the equilateral triangle and three circles representing three gods with the only difference being that here we have a circle in the middle to show that all three are supposed to be one god. This concept of all three being the one god is from Babylon and is not found in the Bible and was not taught by the Apostles or Christ. The trinity doctrine represented by this diagram shows Jesus is not only the Son of God but He is also the God and therefore He is His own Son. And our Heavenly Father is not only our Father but He is also God and hence God is His own Father. It also means that God sent Himself into the world, died to reconcile the world to Himself, raised Himself from the dead, ascended to Himself in heaven, pleads before Himself in heaven to reconcile the world to Himself, and is the only mediator between man and Himself. And that also means that in the garden God prayed to Himself, if it were possible, to let the cup pass from Himself. Are you confused? And yet the Bible says, “God is not the author of confusion,” 1 Corinthians 14:33, Satan is. Should we expect anything less since this three in one doctrine is not in the Bible but comes from Babylon (means confusion) and is actually the worship of Satan? Below we see three interlocking circles or sections. 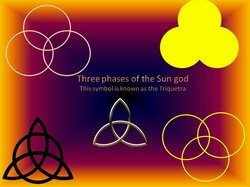 This is known as a triquetra and they found that these three interlocking sections can be substituted for the whole so that part of each circle can be used rather than the whole. This symbol that still represents the three in one sun god is found throughout different cultures and different pagan institutes of belief, and this system is still alive and well to this very day. You will often see the triquetra drawn in many different ways and you will find them in temples, shrines, paintings, etches and carvings. “The triquetra is a satanic symbol that has its origins in the occult. It has always been associated with pagan beliefs, satanic practises and witchcraft. 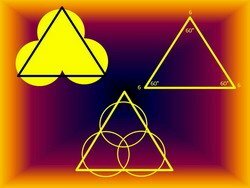 The triquetra is composed of three 6's overlaid. This logo is the ancient symbol for the pagan trinity. The symbol was popularised again by Satanist Aleister Crowley for the Royal Arch (Lucifer) or the 3rd Degree of the Year Order of Masonry.” — New King James Omissions A.V. Publications.) In other words, this symbol is also used today by various secret societies. And we can see from history how this has progressed throughout time. This information helps us see and unmask the deception Satan is using to deceive the whole world. For example, you can find this symbol in some of the most interesting places. Here are a few of them. 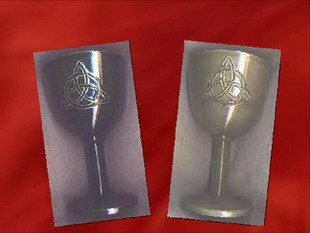 To the right we have wiccan chalices or goblets if you like, which are used by witches in their practises. And what is the symbol on it? 666, Satan, the triquetra. And why would that be? Because witches communicate with Satan. So we should not be at all surprised to find this symbol there. The next one to the left is from a TV series about three witches, not four witches but three witches interestingly enough. And likewise the symbol they use is the symbol of the sun god or the three in one god. It seems that the world is being trained to accept something and so we need to be very selective in what we watch and expose ourselves to. And here are another three. 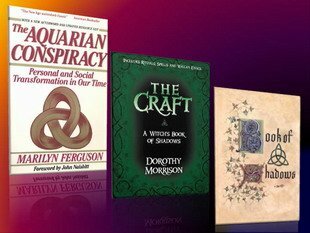 The Aquarian Conspiracy with the three interlocking 6's, The Craft, which if you look carefully has a small triquetra in the middle of the cover. And last is the witches Book of Shadows. And what is the symbol there enlarged? Once again we have the symbol of the sun god, the three in one god, and the symbol for Satan. So this is the witches book of shadows and they make their intentions very plain and do not hide who their loyalties belong to. As shocking as this may be, you will also find this symbol on some editions of the New King James Bible and the New International Version of the Bible. So this symbol has even found its way onto the Bible where it does not belong. This is not a symbol of the God of the Bible but the sun god. 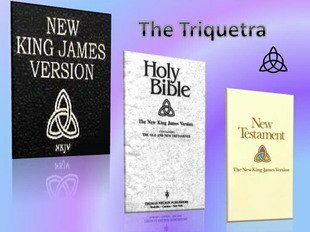 When you read inside the cover of the Bible, if it has the triquetra on it, the description there will tell you it is the ancient symbol of the trinity. Yet these symbols belong to Satan and the three in one sun god. A symbol of the worship of the devil. Compare the top and bottom row of pictures in the image to the right. The bottom row are Christian book covers and the bottom middle picture is a book on the trinity. This is the ultimate deception when the author is teaching the unbiblical and pagan three-in-one trinity doctrine. But then also uses the pagan imagery that represents the true satanic origin of this doctrine by using things such as sun haloes around the heads of what are supposed to represent the Father, Son and Holy Spirit. Did you notice the same sun haloes on both rows? You will also note the triangles around the heads on the bottom left and right with one having three circles representing the sun and the other with one circle representing the sun and the rays of light within. The pagan imagery is blatantly obvious and appears many times in each image so coincidence is an impossibility. Much of the pagan imagery used in ancient times was often carved or engraved in stone and something that God abhors and ordered it to be destroyed. “Then you shall drive out all the inhabitants of the land from before you, and destroy all their pictures, and destroy all their molten images, and quite pluck down all their high places:” Numbers 33:52. Trinitarians, such as those who write these books, will deny or change the truth in support of their belief and say that the trinity does not have its roots in paganism, but the weight of evidence is overwhelming and cannot be avoided. As all the experts say, the three in one god is not found explicitly in scripture but it is in paganism from the worship of the sun god. The bishops that formulated the trinity doctrine were the beginnings of the Papal Church that outlawed Sabbath keeping in favour of Sunday worship that came from sun worship, as well as purgatory and dozens of other unbiblical teachings that have their roots in paganism. These bishops who formulated the doctrine of the trinity were steeped in Greek and Platonic philosophy, and there can be no doubt this influenced their religious views and teaching. So who is Pontifex Maximus and head priest of Babylon now? The Pope! So he has the number 666! 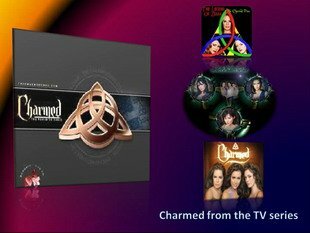 So guess where else we find this satanic symbol called the triquetra? “Here is wisdom. Let him that has understanding count the number of the beast: for it is the number of a man; and his number is Six hundred threescore and six.” Revelation 13:18. God gave us this information and so many have missed it because they are too busy worshipping the gods of Babylon. By the second century, faithful members of the true Church had largely been scattered by waves of deadly persecution and were mostly underground. They held firmly to the biblical truth about Jesus Christ and God the Father, though they were persecuted by the Roman authorities as well as those who professed Christianity. The Church that was above ground grew in power and influence, and within a few short centuries came to dominate even the mighty Roman Empire! Now Satan desired to be worshipped like the most High (Isaiah 14:12-14) and wanted his own day of worship. So sun worship gave rise to Sunday worship in the Church instead of the true day of worship being the Seventh day that we call Saturday, as well as the pagan three in one trinity doctrine. Paganism eventually became mingled with Christianity and was officially adopted by the Papal Church. Many Catholics deny this ever happened but their own Church admits that it is true. So it is not surprising that the two things the Roman Catholic Church mock Protestants for are the two things they brought into the Church that are pagan, and both originated from sun worship, which was Satan worship from Babylon. If only more Christians had a desire to learn the real truth instead of defending what Satan has brought into the Church. The question was asked in the Catholic Catechism. “Q. What is Sunday, or the Lord's Day in general? An interesting statement considering “Sunday worship” and the “Trinity doctrine” both came from sun and Satan worship in Babylon, and they were both brought into Christendom by the Catholic Church whom God calls Babylon! Some of the above information has been taken from the video “The gods of Babylon” and is only a small portion of the information available. I highly recommend watching the entire video for the rest of the story that I have not covered above. You will find it at the bottom of this page or by selecting the link above. So now we know the absolute origins of the trinity doctrine but very few understand how it came to be accepted by the Church several centuries after the Bible was completed. And as you have just seen, its roots go back much farther in history. By late in the first century as we see from 3 John 9-10, conditions had grown so dire that false ministers openly refused to receive representatives of the apostle John and were excommunicating true Christians from the Church! It was not long before true servants of God became a marginalized and scattered minority among those calling themselves Christian. A very different religion, now compromised with many concepts and practices rooted in ancient paganism (such mixing of religious beliefs being known as syncretism, common in the Roman Empire at the time), took hold and transformed the faith founded by Jesus Christ. Ignatius of Antioch was a student and disciple of the Apostle John whom God trusted the book of Revelation. Note below from John's disciple some of the different errors that were creeping into the early Church. Would John have corrected Ignatius if he was in error? And most significantly, note that Ignatius did not believe that the Father, Son and Holy Spirit are one god or that Jesus was co-eternal with the Father. And since Ignatius was John's disciple, what did he teach his student? Notice the name of this chapter is called “Abstain from the Poison of Heretics.” Oh how things have changed. Those who reject the pagan three in one god principle are typically called heretics today, and yet in John's time it was the other way around. Never underestimate Satan to turn truth into error and error into truth. These four verses from John are the only Scriptures in the entire Bible that use the word antichrist. You will note that John says that these people he called antichrist used to be part of the early Church but apostatized and went out on their own (see green highlighted text) and were in the world in his lifetime (see blue highlighted text). Thus these people John is calling antichrist used to be with them and were professed Christians, but they began teaching something that was wrong. So what error did they teach that caused John to call them antichrist? (see yellow highlighted text) We can see that John says they were denying the Father and the Son and that Jesus came in the flesh. But how does a Christian deny the Father and the Son? Read on and find out as this is clearly a salvation issue. In the video further below you will learn that the beloved Apostle John had two students that he taught. Under the guidance and direction of John's teachings, they taught that Jesus was the literal Son of God. One of these students (Ignatius of Antioch as just seen above) stated that some were wrongly teaching that all three are one god just as the trinity doctrine teaches today, and also states that this was antichrist. So who was John calling antichrist? Those who were teaching that all three are the one same god! Why is this antichrist? Because teaching all three are the same one god denies there is a literal Father and Son and so it denies both the Father and Son. The trinity doctrine claims it was the one God playing the role of the Son who died on the cross and hence denies that Jesus came in the flesh as the Son of God! Denying that Jesus is the Son of God also denies God is the Father and so also denies the Father and Son. Note carefully 1 John 2:22-23. The trinity doctrine claims it was the one God who died on the cross and not the literal Son of God, and hence denies that Jesus came in the flesh as the Son of God! This is a startling revelation that reveals the truth and the seriousness of this matter. This is the main reason the Bible teaches that the Papal Church is antichrist. Antichrist is not one man such as the pope as wrongly taught today. It is the entire Catholic system. 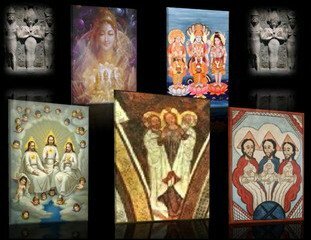 They say, “The mystery of the trinity is the central doctrine of the Catholic faith. Upon it are based all the other teachings of the church.” — (Handbook for Today's Catholic, p. 11). It is antichrist because it denies Jesus because it denies He is truly the literal Son of God who came in the flesh. For Adventists: Note that Ellen White also confirms the above information, so if you choose to believe that the Father, Son and Holy Spirit are one as the trinity doctrine teaches, then John would actually call you antichrist. This is very serious if you value your salvation! So consistent with what the Apostle John said, these spiritualist teachers are Christians that are denying the Father and Son which in turn denies Jesus is the Son of God. So what wrong belief denies the personality of God and His Son which is denying God and Christ? Her husband explains, “Here we might mention the Trinity, which does away [with] the personality of God, and of his Son Jesus Christ,” — (James White, RH, December 11, 1855, p. 85). While Ellen White did not use the word trinity, her husband did. So if you believe in the trinity doctrine then you deny the personality of God and His Son which Ellen White says denies God and Christ, which also denies Jesus is the Son of God, which the Apostle John and Ellen White both said is antichrist. Please watch and listen carefully to this short video that discusses what Tertullian believed as well as two students of the Apostle John that give light to what was just discussed.